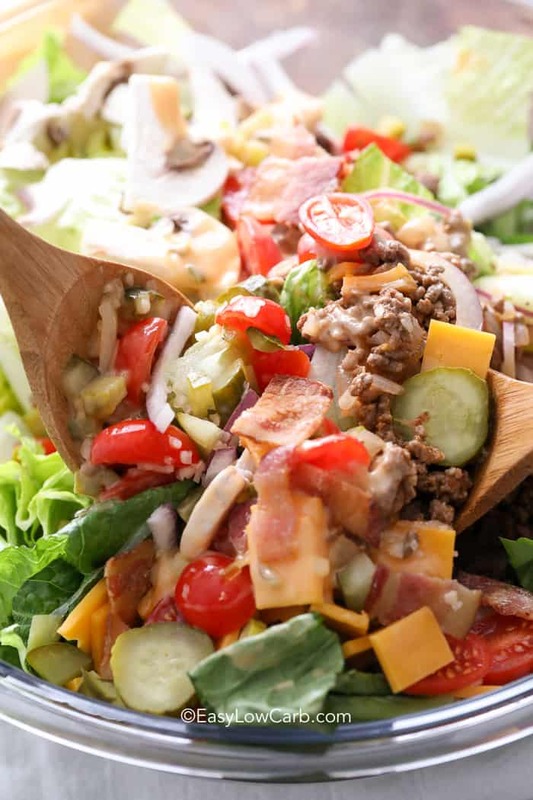 Bacon Cheeseburger Salad brings all of the best parts about having a burger to a salad! I often have a great Chicken Salad or Dorito Taco Salad as a meal but sometimes I love to switch it up a bit too! 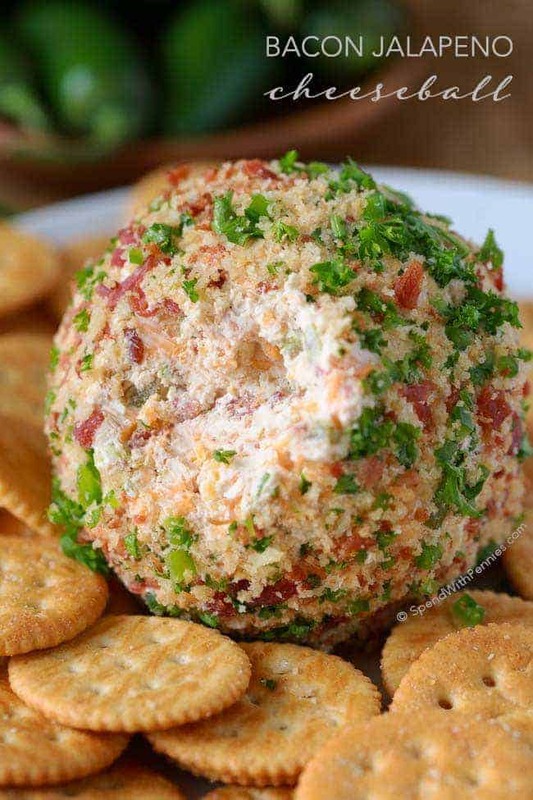 This salad is packed with fresh ingredients and turns your burger a low carb affair! I know you definitely won’t miss the bun after trying this! 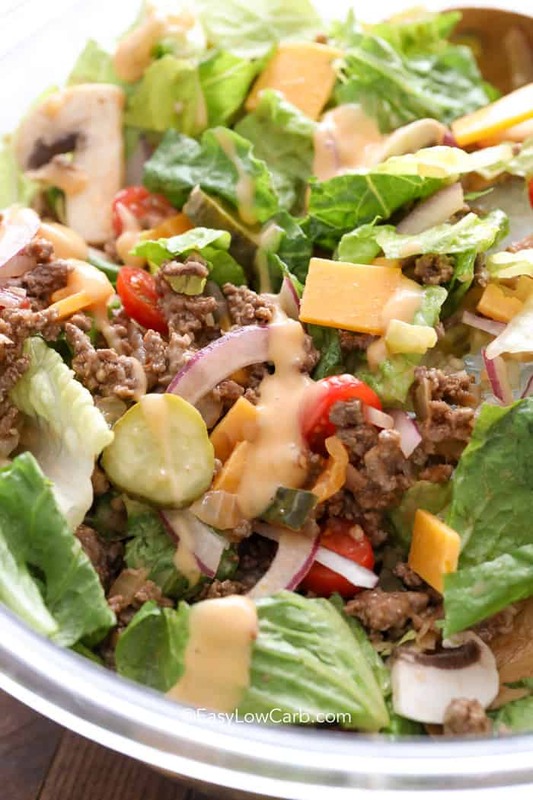 Bacon Cheeseburger Salad is packed with beef, cheese and bacon along with fresh veggies like lettuce, onion and tomato to create a salad that tastes a lot like a favorite fast food burger without the guilt and carbs! I have to admit, I love me a good beefy burger. This recipe for hamburger salad with cheese and bacon comes together in 20 minutes to make a really fun dinner option. Your family will smile at the sound of it, and after tasting it, they will request bacon cheeseburger salad for dinner often! With so many fresh flavors combined with crispy bacon and juicy cheeseburger this salad is fun to eat and really filling too! It has become a regular in my low carb dinner recipe rotation! Cheeseburgers tend to get a bad rap but for this salad, I use lean beef, loads of veggies and a bit of cheese and bacon for flavor. While there’s some indulgence, there is a lot of goodness in this recipe too! 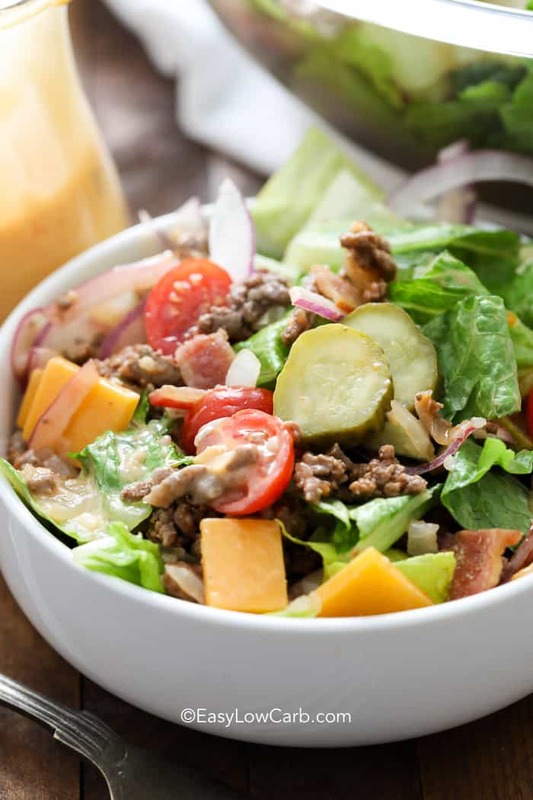 This recipe for cheeseburger salad with BACON is the perfect answer to a complete meal your whole family will love! In just 20 minutes start to finish, you have a delicious salad ready to go, perfect for weeknights! 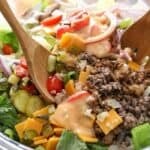 I also love making this bacon cheeseburger salad recipe for lunches, it is super easy to meal prep. Just pack your dressing separately and toss it before you enjoy it. With just 20 minutes, this healthy and delicious meal will be in front of you! Start with getting the ground beef together. Cook the beef, garlic and onion over medium heat until it is cooked through. Drain any excess fat from the pan, and stir in the barbecue sauce. Simmer it for about a minute, and allow it to cool a bit! For a low sugar bbq sauce, I LOVE the G Hughes Smokehouse Sugar Free BBQ. While the ground beef cools, prep the rest of your ingredients. The prep work is most of the time for this recipe like any salad recipe, but it goes by super quickly. Once you have all of the veggies prepped, toss them into a large bowl. Add the beef, thousand island dressing and mustard, and toss to combine. I am a fan of lighter dressing on my salads, so I like to add a little less to begin with and add more if I feel like I need it. You can always add more, but you can’t take it out once it is added! 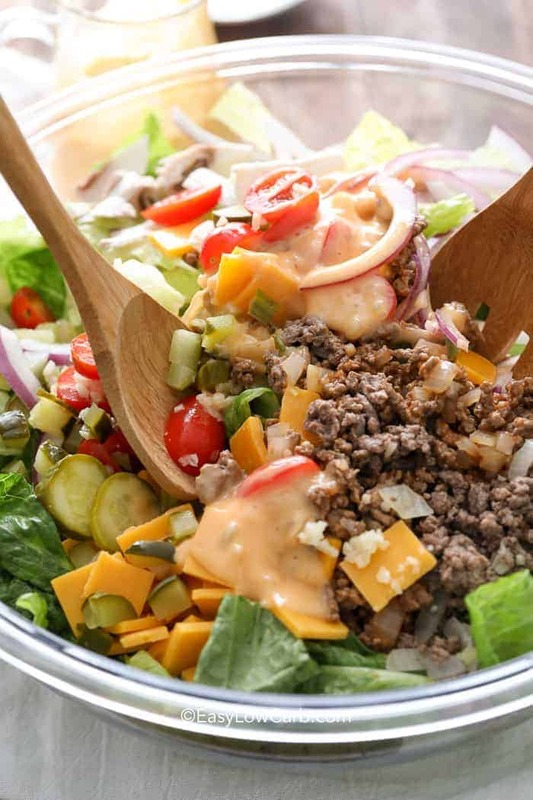 Bacon cheeseburger salad is a fun and healthy dinner option that the whole family will love. 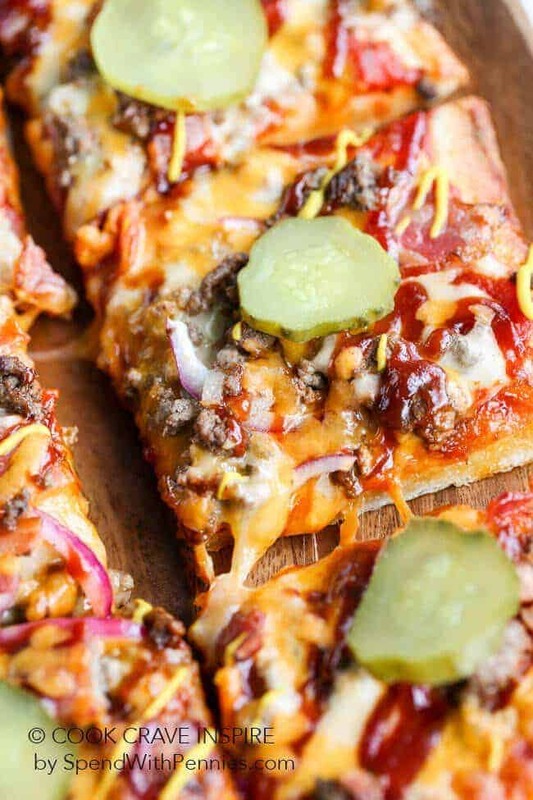 Ground beef is sauteed then tossed with tomatoes, pickled, red onions, romaine lettuce, cheese, bacon, and a tangy dressing to give you a low carb meal like no other. Cook beef, onion and garlic over medium heat until no pink remains. Drain any fat. Add barbecue sauce and simmer 1 minute. Cool slightly. 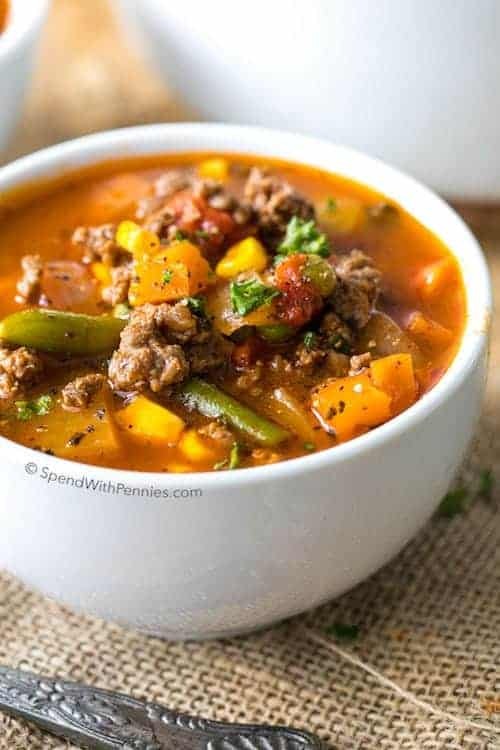 In a large bowl, combine remaining ingredients including beef. Toss and serve. To make your own thousand island dressing combine the following. Keep in mind you only need a pinch of sweetener.